This spaceous home bar area is a tasteful mix of classic and modern elements. The molding details and wall boxes add character and depth to this white enveloped room, while the dark stained wood surroundings give this room a bold shot of warmth. Classic and contemporary styles collide when the glass shelving and suspended globe lighting meets the ionic capital columns and corbel adorned bar. This beautifully crafted blank canvas allows the glassware and other decorative items to serve as functional pieces of art that bring colorful energy to this room. Like a simply colored but well accessorized outfit, this versatile room will never go out of style or season. The decorative wall boxes were created using a thin molding similiar to our ET8711. 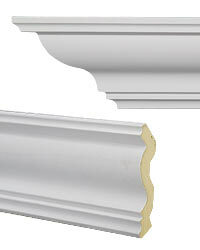 For the baseboard, something similar to the ET-8906 was used, with a quarter round shoe molding on the bottom. Two ionic capital columns were used on each side of the bar, which suit this open area nicely and adds affluence to this room. The arched pieces used on the back wall nicely frame the glass shelves that display the colored glassware. Using arched molding in this way creates an attractive niche and also provides a nice contrast with the other straight lines in the room.